Lucille Désirée Ball (August 6, 1911 – April 26, 1989) was an American actress, comedian, model, entertainment studio executive and producer. She was the star of the self-produced sitcoms I Love Lucy, The Lucy Show, Here's Lucy, and Life with Lucy, as well as comedy television specials aired under the title The Lucy-Desi Comedy Hour. Ball's career began in 1929 when she landed work as a model. Shortly thereafter, she began her performing career on Broadway using the stage names Diane Belmont and Dianne Belmont. She later appeared in several minor film roles in the 1930s and 1940s as a contract player for RKO Radio Pictures, being cast as a chorus girl or in similar roles. During this time, she met Cuban bandleader Desi Arnaz, and the two eloped in November 1940. In the 1950s, Ball ventured into television. In 1951, she and Arnaz created the sitcom I Love Lucy, a series that became one of the most beloved programs in television history. The same year, Ball gave birth to their first child, Lucie Arnaz, followed by Desi Arnaz Jr. in 1953. Ball and Arnaz divorced in May 1960, and she married comedian Gary Morton in 1961. Following the end of I Love Lucy, Ball would go on to appear in a Broadway musical, Wildcat, for a year from 1960 to 1961, although the show received lukewarm reviews and had to be shut down permanently when Ball became ill for a brief time. After Wildcat, Ball reunited with I Love Lucy co-star Vivian Vance for the aforementioned Lucy Show, which Vance departed in 1965 but which was to continue for three years with longtime friend of Ball's Gale Gordon who already had a recurring role on the program. In 1962, Ball became the first woman to run a major television studio, Desilu Productions, which produced many popular television series, including Mission: Impossible and Star Trek. Ball did not back away from acting completely. In 1985, Ball took on a dramatic role in a television film, Stone Pillow. The next year she starred in Life with Lucy, which was, unlike her other sitcoms, not well-received; the show was cancelled after three months. She appeared in film and television roles for the rest of her career until her death in April 1989 from an abdominal aortic dissection at the age of 77. Ball was nominated for 13 Primetime Emmy Awards, winning four times. In 1960, she received two stars for her work in film and television on the Hollywood Walk of Fame. In 1977, Ball was among the first recipients of the Women in Film Crystal Award. She was also the recipient of the Golden Globe Cecil B. DeMille Award in 1979, was inducted into the Television Hall of Fame in 1984, and received the Lifetime Achievement Award from the Kennedy Center Honors in 1986, and the Governors Award from the Academy of Television Arts & Sciences in 1989. Born at 69 Stewart Avenue, Jamestown, New York, Lucille Désirée Ball was the daughter of Henry Durrell Ball (1887–1915) and Désirée "DeDe" Evelyn Ball (née Hunt; 1892–1977). Her family lived in Wyandotte, Michigan, for a time. She sometimes later claimed that she had been born in Butte, Montana, where her grandparents had lived. A number of magazines reported inaccurately that she had decided that Montana was a more romantic place to be born than New York and repeated a fantasy of a "western childhood". However her father had moved the family to Anaconda for his work, where they lived briefly, among other places. Her family belonged to the Baptist church. Her ancestors were mostly English, but a few were Scottish, French, and Irish. Some were among the earliest settlers in the Thirteen Colonies, including Elder John Crandall of Westerly, Rhode Island, and Edmund Rice, an early emigrant from England to the Massachusetts Bay Colony. In February 1915, when Lucille was three years old, her 27-year-old father died of typhoid fever. Henry Ball was a lineman for Bell Telephone Company and was frequently transferred. The family had moved from Jamestown to Anaconda, Montana, and later to Trenton, New Jersey. At the time of Henry's death, DeDe Ball was pregnant with her second child, Frederick. Ball recalled little from the day her father died, but remembered a bird getting trapped in the house. From that day forward, she suffered from ornithophobia. After Ball's father died, her mother returned to New York. Ball and her brother, Fred Henry Ball (1915–2007), were raised by their mother and maternal grandparents in Celoron, New York, a summer resort village on Lake Chautauqua, 2.5 miles west of downtown Jamestown. Lucy loved Celoron Park, one of the best amusement areas in the United States at that time. Its boardwalk had a ramp to the lake that served as a children's slide, the Pier Ballroom, a roller-coaster, a bandstand, and a stage where vaudeville concerts and regular theatrical shows were presented which made Celoron Park a popular resort. Four years after Henry Ball's death, DeDe Ball married Edward Peterson. While her mother and stepfather looked for work in another city, Peterson's parents cared for her and her brother. Ball's stepgrandparents were a puritanical Swedish couple who banished all mirrors from the house except one over the bathroom sink. When the young Ball was caught admiring herself in it, she was severely chastised for being vain. This period of time affected Ball so deeply that, in later life, she said that it lasted seven or eight years. Peterson was a Shriner. When his organization needed female entertainers for the chorus line of their next show, he encouraged his 12-year-old stepdaughter to audition. While Ball was onstage, she realized performing was a great way to gain praise and recognition. Her appetite for recognition was awakened at an early age. In 1927, her family suffered misfortune. Their house and furnishings were lost to settle a financial legal judgment after a neighborhood boy was accidentally shot and paralyzed by someone target shooting in their yard under the supervision of Ball's grandfather. The family subsequently moved into a small apartment in Jamestown. In 1925, Ball, then only 14, started dating Johnny DeVita, a 21-year-old local hoodlum. DeDe was unhappy with the relationship, but unable to influence her daughter to end it. She expected the romance to burn out after a few weeks, but that did not happen. After about a year, DeDe tried to separate them by exploiting Lucille's desire to be in show business. Despite the family's meager finances, she arranged for Lucille to attend the John Murray Anderson School for the Dramatic Arts, in New York City, where Bette Davis was a fellow student. She enrolled in 1926. Ball later said about that time in her life, "All I learned in drama school was how to be frightened." Ball's instructors felt she would not be successful in the entertainment business, and were not afraid to say this to her face. In the face of this harsh criticism, Ball was determined to prove her teachers wrong and returned to New York City in 1928. That same year, she began working for Hattie Carnegie as an in-house model. Carnegie ordered Ball to dye her then-brown hair blonde, and Ball complied. Of this time in her life, Ball said, "Hattie taught me how to slouch properly in a $1,000 hand-sewn sequin dress and how to wear a $40,000 sable coat as casually as rabbit." Ball's career was thriving when she became ill with rheumatoid arthritis and was unable to work for two years. In 1932, she moved back to New York City to resume her pursuit of an acting career and supported herself again by working for Carnegie and as the Chesterfield cigarette girl. Using the name Diane (sometimes spelled Dianne) Belmont, she started getting chorus work on Broadway, but it was not lasting. Ball was hired – but then quickly fired – by theatre impresario Earl Carroll, from his Vanities, and by Florenz Ziegfeld, from a touring company of Rio Rita. After an uncredited stint as a Goldwyn Girl in Roman Scandals (1933), starring Eddie Cantor and Gloria Stuart, Ball moved permanently to Hollywood to appear in films. She had many small movie roles in the 1930s as a contract player for RKO Radio Pictures, including a two-reel comedy short with the Three Stooges (Three Little Pigskins, 1934) and a movie with the Marx Brothers (Room Service, 1938). She also appeared as one of the featured models in the Fred Astaire and Ginger Rogers film Roberta (1935), as the flower girl in Top Hat (1935), and in a brief supporting role at the beginning of Follow the Fleet (1936), another Astaire-Rogers film. Ball and Ginger Rogers, who were distant maternal cousins, played aspiring actresses in the film Stage Door along side Katharine Hepburn (1937). In 1936, she landed the role she hoped would lead her to Broadway, in the Bartlett Cormack play Hey Diddle Diddle, a comedy set in a duplex apartment in Hollywood. The play premiered in Princeton, New Jersey, on January 21, 1937, with Ball playing the part of Julie Tucker, "one of three roommates coping with neurotic directors, confused executives, and grasping stars, who interfere with the girls' ability to get ahead". The play received good reviews, but problems existed, chiefly with its star, Conway Tearle, who was in poor health. Cormack wanted to replace him, but the producer, Anne Nichols, said the fault lay with the character and insisted that the part needed to be reshaped and rewritten. The two were unable to agree on a solution. The play was scheduled to open on Broadway at the Vanderbilt Theatre, but closed after one week in Washington, DC, when Tearle suddenly became gravely ill.
Ball later auditioned for the role of Scarlett O'Hara for Gone with the Wind (1939), but Vivien Leigh got the part, winning an Academy Award for Best Actress for her role. In 1940, Lucy appeared as the female lead in a movie musical entitled “Too Many Girls.” This was when she met and fell in love with Desi Arnaz, who played one of the four bodyguards in the movie. Ball signed with Metro-Goldwyn-Mayer in the 1940s, but never achieved major stardom there. She was known in Hollywood circles as "Queen of the B's"[citation needed]—a title previously held by Fay Wray—starring in a number of B-movies, such as Five Came Back (1939). Like many budding actresses, Ball picked up radio work to supplement her income and gain exposure. In 1937, she appeared regularly on The Phil Baker Show. When its run ended in 1938, Ball joined the cast of The Wonder Show starring Jack Haley (best remembered as the Tin Woodman in The Wizard of Oz, 1939). There began her 50-year professional relationship with the show's announcer, Gale Gordon. The Wonder Show lasted one season, with the final episode airing on April 7, 1939. MGM producer Arthur Freed purchased the Broadway hit musical play DuBarry Was a Lady (1943) especially for Ann Sothern, but when she turned down the part, that plum role went to Ball, Sothern's real-life best friend. In 1946, Ball starred in Lover Come Back. In 1947, she appeared in the murder mystery Lured as Sandra Carpenter, a taxi dancer in London. In 1948, Ball was cast as Liz Cooper (at first "Cugat"; this was changed because listeners were getting the characters confused with a real-life bandleader, Xavier Cugat), a wacky wife, in My Favorite Husband, an audio program for CBS Radio. The show was successful, and CBS asked her to develop it for television. She agreed, but insisted on working with her real-life husband, Cuban bandleader Desi Arnaz. CBS executives were reluctant, thinking the public would not accept an All-American redhead and a Cuban as a couple. CBS was initially unimpressed with the pilot episode, produced by the couple's Desilu Productions company. The pair went on the road with a vaudeville act, in which Lucy played the zany housewife, wanting to get into Arnaz's show. Given the great success of the tour, CBS put I Love Lucy into their lineup. Along the way, Ball created a television dynasty and achieved several firsts. She was the first woman to head a TV production company: Desilu, which she had formed with Arnaz. After their divorce, she bought out his share and became a very actively engaged studio head. Desilu and I Love Lucy pioneered a number of methods still in use in TV production today, such as filming before a live studio audience with a number of cameras, and distinct sets, adjacent to each other. During this time, Ball taught a 32-week comedy workshop at the Brandeis-Bardin Institute. She was quoted as saying, "You cannot teach someone comedy; either they have it or they don't." During the run of I Love Lucy, Ball and Arnaz wanted to remain in their Los Angeles home, but time-zone logistics made that difficult. Since prime time in L.A. was too late at night on the East Coast to air a major network series, filming in California would have meant giving most of the TV audience an inferior kinescope picture — and, at least, a day later. Sponsor Philip Morris did not want to show day-old kinescopes to major East Coast markets, nor did they want to pay the extra cost that filming, processing, and editing would require. So, the company pressured Ball and Arnaz to relocate to New York City. The couple offered to take a pay cut to finance filming, on the condition that Desilu would retain the rights of each episode once it aired. CBS agreed to relinquish the post-first-broadcast rights to Desilu, not realizing they were giving up a valuable and enduring asset. In 1957, CBS bought back the rights for $1,000,000 ($8.92 million in today's terms), providing Ball and Arnaz's down payment for the purchase of the former RKO Pictures studios, which they turned into Desilu Studios. Desilu produced several other popular shows, such as The Untouchables, Star Trek, and Mission: Impossible. The studio was eventually sold in 1967 for $17,000,000 ($128 million in today's terms) and merged into Paramount Pictures. In 1959, Ball became a friend and mentor to Carol Burnett. She guested on Burnett's highly successful CBS-TV special Carol + 2 and the younger performer reciprocated by appearing on The Lucy Show. It was rumored that Ball offered Burnett a chance to star on her own sitcom, but in truth Burnett was offered (and declined) "Here's Agnes" by CBS executives. She instead chose to create her own variety show due to a stipulation that was on an existing contract she had with CBS. The two women remained close friends until Ball's death in 1989. Ball sent flowers every year on Burnett's birthday. When Burnett awoke on the day of her 56th birthday in 1989, she discovered via the morning news that Lucille Ball had died. Later that afternoon, flowers arrived at Burnett's house with a note reading, "Happy Birthday, Kid. Love, Lucy." Ball was originally considered by Frank Sinatra for the role of Mrs. Iselin in the Cold War thriller The Manchurian Candidate. Director/producer John Frankenheimer, however, had worked with Angela Lansbury in a mother role in All Fall Down and insisted on having her for the part. Ball was the lead actress in a number of comedy television specials to about 1980, including Lucy Calls the President which featured Vivian Vance, Gale Gordon and Mary Jane Croft, and Lucy Moves to NBC, a special depicting a fictionalization of her move to the NBC television network. Aside from her acting career, she became an assistant professor at California State University, Northridge in 1979. Ball at her last public appearance at the 61st Academy Awards in 1989, four weeks before her death: Ball's husband Gary Morton can be seen on the left side of the photograph. During the mid-1980s, Ball attempted to resurrect her television career. In 1982, she hosted a two-part Three's Company retrospective, showing clips from the show's first five seasons, summarizing memorable plotlines, and commenting on her love of the show. A 1985 dramatic made-for-TV film about an elderly homeless woman, Stone Pillow, received mixed reviews. Her 1986 sitcom comeback Life with Lucy, costarring her longtime foil Gale Gordon and co-produced by Ball, Gary Morton, and prolific producer/former actor Aaron Spelling was cancelled less than two months into its run by ABC. In February 1988, Ball was named the Hasty Pudding Woman of the Year. In May 1988, Ball was hospitalized after suffering a mild heart attack. Her last public appearance, just one month before her death, was at the 1989 Academy Awards telecast in which she and fellow presenter Bob Hope were given a standing ovation. Within a few days after my third application to join the Communist Party was made, I received a notice to attend a meeting on North Ogden Drive, Hollywood; although it was a typed, unsigned note, merely requesting my presence at the address at 8 o'clock in the evening on a given day, I knew it was the long-awaited notice to attend Communist Party new members classes ... on arrival at this address I found several others present; an elderly man informed us that we were the guests of the screen actress, Lucille Ball, and showed us various pictures, books, and other objects to establish that fact, and stated she was glad to loan her home for a Communist Party new members class. —  Affidavit of Rena M. Vale, November 23, 1942. Joint Fact-Finding Committee on Un-American Activities in California. In a 1944 British Pathé newsreel, titled Fund Raising for Roosevelt, Ball was featured prominently among several stage and film stars at events in support of President Franklin D. Roosevelt's fundraising campaign for the March of Dimes. She stated that in the 1952 US Presidential Election, she voted for Republican Dwight Eisenhower. Ball stated she has never been a member of the Communist Party "to her knowledge" ... [She] did not know whether or not any meetings were ever held at her home at 1344 North Ogden Drive; stated... [that if she had been appointed] as a delegate to the State Central Committee of the Communist Party of California in 1936 it was done without her knowledge or consent; [and stated that she] did not recall signing the document sponsoring EMIL FREED for the Communist Party nomination to the office of member of the assembly for the 57th District ... A review of the subject's file reflects no activity that would warrant her inclusion on the Security Index. Immediately before the filming of episode 68 ("The Girls Go Into Business") of I Love Lucy, Desi Arnaz, instead of his usual audience warm-up, told the audience about Lucy and her grandfather. Reusing the line he had first given to Hedda Hopper in an interview, he quipped: "The only thing red about Lucy is her hair, and even that is not legitimate." In 1940, Ball met Cuban-born bandleader Desi Arnaz while filming the Rodgers and Hart stage hit Too Many Girls. When they met again on the second day, the two connected immediately and eloped the same year. Although Arnaz was drafted into the Army in 1942, he ended up being classified for limited service due to a knee injury. As a result, Arnaz stayed in Los Angeles, organizing and performing USO shows for wounded GIs being brought back from the Pacific. Several demands were made by CBS, insisting that a pregnant woman could not be shown on television, nor could the word "pregnant" be spoken on-air. After approval from several religious figures the network allowed the pregnancy storyline, but insisted that the word "expecting" be used instead of "pregnant". (Arnaz garnered laughs when he deliberately mispronounced it as "'spectin'".) The episode's official title was "Lucy Is Enceinte", borrowing the French word for pregnant; however, episode titles never appeared on the show. On March 3, 1960, a day after Desi's 43rd birthday (and one day after the filming of Lucy and Desi's last episode together), Ball filed papers in Santa Monica Superior Court, claiming married life with Desi was "a nightmare" and nothing at all as it appeared on I Love Lucy. The following year, Ball starred in the Broadway musical Wildcat, which co-starred Keith Andes and Paula Stewart. It marked the beginning of a 30-year friendship between Lucy and Stewart, who introduced Lucy to second husband, Gary Morton, a Borscht Belt comic who was 13 years her junior. According to Ball, Morton claimed he had never seen an episode of I Love Lucy due to his hectic work schedule. Ball immediately installed Morton in her production company, teaching him the television business and eventually promoting him to producer. Morton played occasional bit parts on Ball's various series. Ball was outspoken against the relationship her son had with actress Patty Duke. Later, commenting on when her son dated Liza Minnelli, she was quoted as saying, "I miss Liza, but you cannot domesticate Liza." On April 18, 1989, Ball complained of chest pains at her home in Beverly Hills and was taken to Cedars-Sinai Medical Center, where she was diagnosed with dissecting aortic aneurysm and underwent an eight-hour aortic transplant. The surgery was successful, and Ball was soon able to walk around her room with little assistance. She received a flurry of get-well wishes, and across the street from the hospital the Hard Rock Café erected a sign reading "Hard Rock Loves Lucy". Shortly after dawn on April 26, Ball awoke with severe back pains then lost consciousness; she died at 5:47 a.m. PDT. Doctors determined that Ball had succumbed to a ruptured abdominal aortic aneurysm not directly related to her upper aneurysm and surgery. Ball had been a heavy smoker most of her life, increasing her risk of abdominal aneurysm. Her body was cremated and the ashes were initially interred in Forest Lawn – Hollywood Hills Cemetery in Los Angeles. In 2002, her children moved her remains to the Hunt family plot at Lake View Cemetery in Jamestown, New York, where her grandparents are buried. On February 8, 1960, Ball was awarded two stars on the Hollywood Walk of Fame: one at 6436 Hollywood Boulevard for contributions to motion pictures, and one at 6100 Hollywood Boulevard for television. Ball received many prestigious awards throughout her career, including some posthumously such as the Presidential Medal of Freedom by President George H. W. Bush on July 6, 1989, and The Women's International Center's 'Living Legacy Award'. A Lucille Ball-Desi Arnaz Center museum is in Lucy's hometown of Jamestown, New York. The Little Theatre was renamed the Lucille Ball Little Theatre in her honor. Ball was among Time magazine's "100 Most Important People of the Century". On June 7, 1990, Universal Studios Florida opened a walk-through attraction dedicated to Ball, Lucy – A Tribute, which featured clips of shows, as well as various pieces of trivia about her, along with items owned by or associated with Lucille, and an interactive quiz for guests. The attraction was permanently closed on August 17, 2015. On August 6, 2001, which would have been her 90th birthday, the United States Postal Service honored her with a commemorative postage stamp as part of its Legends of Hollywood series. Ball appeared on the cover of TV Guide more than any other person; she appeared on 39 covers, including the first cover in 1953 with her baby son, Desi Arnaz, Jr. TV Guide voted Lucille Ball as the 'Greatest TV Star of All Time' and it later commemorated the 50th anniversary of I Love Lucy with eight collector covers celebrating memorable scenes from the show. In another instance it named I Love Lucy the second-best television program in American history, after Seinfeld. Due to her support for the Women's Movement, Ball was inducted into the National Women's Hall of Fame in 2001. The Friars Club named a room in its New York clubhouse for Lucille Ball (the Lucille Ball Room). She was posthumously awarded the 'Legacy of Laughter' award at the fifth Annual TV Land Awards in 2007. In November 2007, Lucille Ball was chosen as number two on a list of the '50 Greatest TV Icons'; a public poll, however, chose her as number one. On August 6, 2011, which would have been her 100th birthday, Google honored Ball with an interactive doodle on their homepage, which displayed six classic moments from I Love Lucy. On the same day, a total of 915 Ball look-alikes converged on Jamestown to celebrate the birthday and set a new world record for such a gathering. Since 2009, a statue of Ball has been on display in Celoron, New York. Residents deemed that statue "scary" and not accurate, earning it the nickname "Scary Lucy". On August 1, 2016, it was announced that a new statue of Ball would replace it. The new statue replaced the old one on August 6, 2016. However, since the old statue became a local tourist attraction after receiving media attention, it was placed 75 yards from its original location so visitors could visit both statues. In 2015, it was announced that Ball would be played by Cate Blanchett in an untitled biographical film, to be written by Aaron Sorkin. Ball was portrayed by Gillian Anderson, as her character Lucy Ricardo, in the American Gods episode "The Secret of Spoons" (2017). Ball was portrayed by Sarah Drew in I Love Lucy: A Funny Thing Happened on the Way to the Sitcom, a comedy about how Ball and her husband battled to get their sitcom on the air. It had its world premiere in Los Angeles on July 12, 2018, co-starring Oscar Nuñez as Desi Arnaz, and Seamus Dever as I Love Lucy creator-producer-head writer Jess Oppenheimer. The play, written by Jess Oppenheimer's son, Gregg Oppenheimer, was recorded in front of a live audience for nationwide public radio broadcast and online distribution. Ball was a well known gay rights supporter stating in a 1980 interview with People, "It's perfectly all right with me. Some of the most gifted people I’ve ever met or read about are homosexual. How can you knock it?" 1944 Suspense "Dime a Dance"
1944 Suspense "The Ten Grand"
1944 Lux Radio Theatre "Lucky Partners"
1945 Suspense "A Shroud for Sarah"
1947 Lux Radio Theatre "The Dark Corner"
^ a b Staff. "Lucille Ball's Ashes Moved to Jamestown, New York". Lisa Burks. Archived from the original on November 14, 2013. Retrieved May 12, 2013. ^ "Lucille Ball Biography". killer-media.com. January 2, 2017. Archived from the original on January 3, 2017. Retrieved January 2, 2017. ^ a b "Lucie Arnaz Filmography". Fandango. Archived from the original on March 20, 2008. Retrieved April 5, 2008. ^ a b Sanders & Gilbert 1993, p. 216. ^ "Arnaz Quits Presidency Of Desilu; Former Wife, Lucille Ball, Gets Post", Wall Street Journal, November 9, 1962, p. 18. ^ a b "Walk of Fame: Lucille Ball". Retrieved December 22, 2017. ^ "Past Recipients: Crystal Award". Women In Film. Archived from the original on June 30, 2011. Retrieved May 10, 2011. ^ "The Cecil B. DeMille Award". Hollywood Foreign Press Association. Archived from the original on March 10, 2012. Retrieved March 10, 2012. ^ "List of Kennedy Center Honorees". Kennedy-center.org. Archived from the original on December 9, 2008. Retrieved March 10, 2012. ^ "Hall of Fame Archives: Inductees". Academy of Television Arts & Sciences. Archived from the original on December 5, 2009. Retrieved March 10, 2012. ^ Patch, Jason Alley, , patch.com, August 7, 2011. ^ a b Higham, C. (1986). Lucy: The Life of Lucille Ball, New York: St. Martin's Press. ^ Kanfer 2003, p. 10. ^ Ball 1997, pp. 168–69. ^ "Some Ancestral Remains of Lucille Ball". Rootsweb.com. Retrieved October 6, 2012. ^ "Isaac Ball (1747-?)". Edmund Rice (1638) Association. Lucille Desiree Ball (1911–1989) was a descendant of Edmund Rice as follows: Edmund Rice (1594–1663); Henry Rice (1617–1711); Elizabeth Rice (1648–1740); Mary Brewer (1680–? ); Isaac Ball (? –1789); Isaac Ball (1747–1790); Isaac Ball (1787–1865); Clinton Manross Ball (1817–1893); Jasper Clinton Ball (1852–933); Henry Durell Ball (1887–1915) and Lucille Désirée Ball (1911–1989). Retrieved May 13, 2012. ^ Kanfer 2003, p. 12. ^ "Lucille Ball Biography". Encyclopedia of World Biography. Retrieved April 5, 2008. ^ Harris 1991, pp. 23–24. ^ Kanfer 2003, p. 16. ^ Kanfer 2003, p. 20. ^ Ball 1996, p. 41. ^ Brady 2001, p. 20. ^ Kanfer 2003, p. 24. ^ Swift, Sunday (February 2019). "Lucille Ball". Chap. Spring 2019: 29–33. ^ Kanfer 2003, p. 205. ^ Kanfer 2003, p. 30. ^ Kanfer, Stefan (December 18, 2007). Ball of Fire: The Tumultuous Life and Comic Art of Lucille Ball. Knopf Doubleday Publishing Group. ISBN 9780307424914. ^ "Lucille Ball Trivia". NetGlimse. Archived from the original on May 21, 2005. Retrieved March 14, 2012. ^ Brady 2001, p. 33. ^ Kanfer 2003, p. 28. ^ Darryl J. Littleton; Tuezdae Littleton (2012). Comediennes: Laugh Be a Lady – "Lucille Ball". Hal Leonard Corporation. p. (eBook)(Chapter 5). ISBN 9781480329744. Retrieved April 5, 2016. ^ a b c d e Karol, Michael (2004). Lucy A to Z: The Lucille Ball Encyclopedia. iUniverse. ISBN 0-595-29761-7. ^ Brady, Kathleen (2001). Lucille: The Life of Lucille Ball. Random House Digital Inc. p. 73. ISBN 978-0-8230-8913-0. Retrieved December 26, 2012. ^ Brady 2001, pp. 73–74. ^ Karol 2004, p. 201. ^ Kanfer 2003, p. 220. ^ "How "Carol Burnett Show" almost never happened". CBS News. September 25, 2012. Retrieved August 30, 2018. ^ Fink, Mitchell (2007). The Last Days of Dead Celebrities. New York City: Miramax Books. ISBN 978-1401360252. ^ Frankenheimer's DVD audio commentary. ^ Stern, Michael (2016). "20". I Had a Ball: My Friendship with Lucille Ball Revised Edition. iUniverse. ISBN 978-1532011412. ^ "Lucille Ball at Hasty Pudding". Ten O'Clock News, WGBH. February 19, 1988. ^ "Local News in Brief: Lucille Ball Recovering". Los Angeles Times. June 1, 1988. ^ Ancestry.com (January 30, 2008). 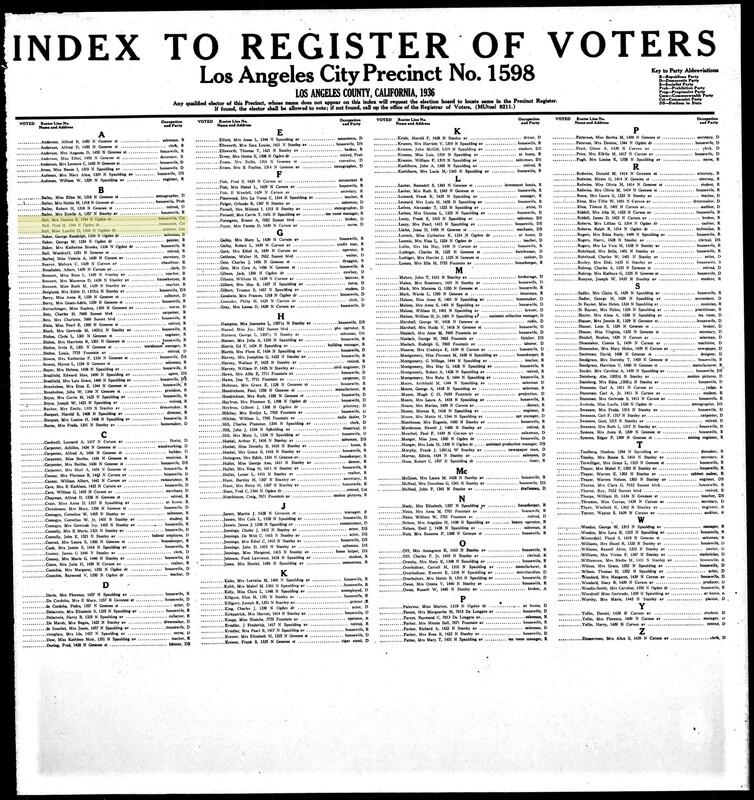 "New California Voter Registrations Reveal Celebrity Party Lines". Ancestry.com. Retrieved March 14, 2012. ^ FBI file, pp. 10–13: FBI memorandum: D.M. Ladd to Hoover, Subject: Lucille Ball, Dezi [sic] Arnaz, September 17, 1953. ^ Fundraising for Roosevelt (video newsreel film). Washington, DC: British Pathé. Retrieved June 14, 2011. ^ FBI file, p. 24: FBI memorandum: SAC Los Angeles to Hoover, Subject: Lucille Ball, was., December 16, 1953. Cf. Sanders & Gilbert 2001, pp. 77–78. ^ Brioux, Bill (2007). Truth and Rumors: The Reality Behind Tv's Most Famous Myths. Greenwood Publishing Company. p. 37. ISBN 9780275992477. Retrieved July 4, 2012. ^ "Arnaz, Desi". tcm.com. Retrieved July 17, 2014. ^ "Radio: Birth of a Memo". Time. January 26, 1953. Retrieved June 14, 2011. ^ "Celebrity Commercials in TV's Golden Age". Teletronic. Archived from the original on August 19, 2010. Retrieved April 5, 2008. ^ Andrews, Bart` (1976). Lucy and Ricky and Fred and Ethel. Toronto and Vancouver: Clarke, Irwin & Company Limited. p. 166. ^ Kanfer 2003, pp. 72–84. "Ball and Arnaz remain friends". ^ Kanfer 2003, pp. 94, 103. ^ Kanfer 2003, pp. 35–37. ^ "Article: Lucille Ball, Pioneer of Television Comedy, Dies at 77". Archived from the original on November 6, 2012. Retrieved August 31, 2009. ^ Ball, Lucille (April 27, 1989). "Ball dies of ruptured aorta". L.A. Times. Retrieved May 12, 2013. ^ Ball, Lucille (April 27, 1989). "Lucy dies". Chicago Tribune. Retrieved May 12, 2013. ^ "NATION: Lucille Ball Gets Medal of Freedom". Los Angeles Times. July 6, 1989. Retrieved May 22, 2011. ^ "TIME 100 – People of the Century". Time Magazine. Retrieved April 9, 2008. ^ "Lucy – A Tribute". Universal Studios Orlando. Retrieved July 8, 2015. ^ "Universal: Lucy attraction out, Hello Kitty in". Orlando Sentinel. August 17, 2015. Retrieved October 17, 2015. ^ "Lucille Ball Room". The Friars Club. Archived from the original on December 3, 2012. Retrieved August 27, 2013. ^ "TV Land loves Lucy". Los Angeles Times. April 15, 2007. Retrieved May 10, 2007. ^ Associated Press (November 16, 2007). "Carson tops list of 50 greatest TV icons". MSNBC. Retrieved March 19, 2008. ^ Nancy Blair (August 6, 2011). "Google Doodle pays charming tribute to Lucille Ball on her 100th". USA Today. Retrieved August 6, 2011. ^ "915 Lucille Ball look-alikes set record", upi.com; accessed December 8, 2014. ^ Hunter, Marnie (April 7, 2015). "Mayor rejects artist's offer to fix 'Scary Lucy' statue". CNN. Retrieved April 8, 2015. ^ Kimble, Lindsay. "Lucille Ball's 'Scary Lucy' replacement statue unveiled". Entertainment Weekly. Retrieved August 6, 2016. ^ Stack, Liam (August 9, 2016). "Here's Lucy! 'Scary' Statue Is Replaced With One That Looks Like Her". The New York Times. Retrieved May 20, 2017. ^ McNary, Dave (September 2, 2015). "Cate Blanchett to star in Lucille Ball biopic from Aaron Sorkin". Variety. Retrieved September 5, 2015. ^ "Gillian Anderson dishes on her Lucille Ball moment", Entertainment Weekly, May 7, 2017; retrieved July 30, 2017. ^ "Ask Her Anything About Desi Sr., Divorce, Drugs, Gay Rights—Lucy Ball Hasn't Become Bashful at 68". People.com. ^ "Escape and Suspense! : Suspense – Dime a Dance". Escape-suspense.com. November 16, 2008. Retrieved May 19, 2017. ^ "Escape and Suspense! : Suspense – A Shroud for Sarah". Escape-suspense.com. February 5, 2012. Retrieved May 19, 2017. ^ "Those Were The Days". Nostalgia Digest. 39 (2): 32–39. Spring 2013. ^ "Lucille Ball". IMDb. Retrieved December 26, 2018. ^ "Lucille Ball | Hollywood Walk of Fame". www.walkoffame.com. Retrieved December 26, 2018. ^ "Television Hall of Fame: Actors - Online Film & Television Association". Retrieved December 26, 2018. Ball, Lucille (1997). Hoffman, Betty Hannah (ed.). Love, Lucy. New York: Berkly. ISBN 978-0-425-17731-0. OCLC 52255505. Sanders, Coyne Steven; Gilbert, Thomas W. (1993). Desilu: The Story of Lucille Ball and Desi Arnaz. HarperCollins. ISBN 978-0-688-13514-0. Wikimedia Commons has media related to Lucille Ball. Flint, Peter B. (April 27, 1989). "Lucille Ball, Spirited Doyenne Of TV Comedies, Dies at 77". Obituary. The New York Times. "Celebrating Lucille Ball at 100: Unpublished Photos". LIFE (Sideshow). Norwood, Arlisha. "Lucille Ball", National Women's History Museum. 2017.